The Mabel Hartzell Historical Home was built in 1867 for Matthew and Mary Edwards Earley. Matthew was born in Poland in 1829 and arrived in Alliance in 1859 and six years later he married Mary Edwards. Matthew operated a tannery, a machine shop and was a city councilman. Two years after their marriage, the Earley's built this home for themselves. Since that day the home has only been owned by the Earley's, Mabel Hartzell, and the Alliance Historical Society. It is an excellent example of mid 19th Century architecture. 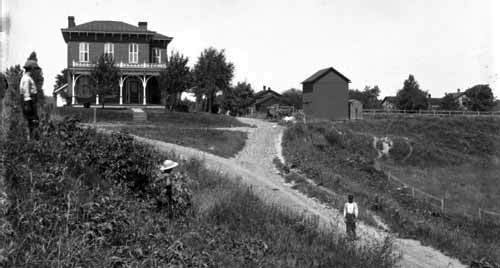 Matthew Earley home as it appeared in the 1890s. 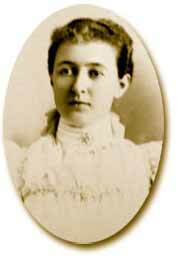 Mabel and her family arrived from Michigan in 1883 when she was just 8 years old. A year later her mother died and the family was split up. The Matthew and Mary Earley were friends with the Hartzell family and having no children of their own, agreed to adopt 9 year old Mabel. Although the adoption was official it was agreed that Mabel should keep her family name. After the Earley's passed away, the family home became Mabel's. She owned the home there on N. Park Avenue until she died in 1954. At that time she stated in her will that the property be given to the Alliance Historical Society, which she founded among other organizations throughout her lifetime. She also was the founder of the Mount Union College Women's Club, the Alliance Woman's Club, and founder of the Alliance Chapter of the American Red Cross where she was director for 33 years. 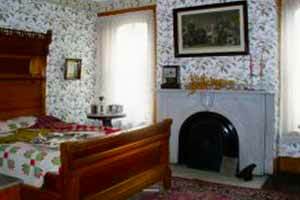 Although she had her choice of rooms in the house, it was the room called the guest bedroom that Mabel Hartzell selected as her bedroom. Shown in the above photo is the Italian marble fireplace. Place on the hearth is a square stone that was used on cold winter nights to warm the sheets before retiring. The Mabel Hartzell Historic Home, is owned and operated by the Alliance Historical Society. Tours are available by appointment throughout the year and is open to the public during special events such as the Greater Alliance Area Carnation Festival. For further information, call 330-823-1677.